The accuracy and detail achievable with today's diagnostic imaging technology is unprecedented. But to obtain such high levels of diagnostic utility, a considerable amount of data must be collected and processed. Preparing for an optimal reading takes time: you have to select the proper protocol, load the images, wait for them to process, and only then can you begin reading. And when the next patient is scanned, you start the process over again. This succession of redundant routine tasks impacts the diagnostic time of 3D image processing. AW Preprocessing streamlines your workflow by loading and processing images in the background so that exams are ready for reading when you are. 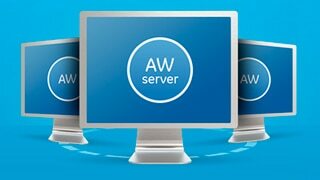 The AW Workstation Preprocessing feature speeds your workflow and gives you greater flexibility by automatically applying the appropriate protocol, loading image sets, and processing studies, in the back ground, so they are ready to read when you're ready to read them. Streamlines your workflow by loading and processing exams in the background. Preset protocols1 remove bone in all anatomies, track and label coronaries, and track and unfold colon. 1. Some functionality are linked to optional purchasable packages. 2. The Autolaunch feature is only available on the AW Workstation. On the AW Server, up to 3 exams can be opened simultaneously. Exams are automatically loaded and processed when transferred to the AW system. No waiting for image loading and processing. Processing is performed in the background while you read another exam. Saves time, so you can read more cases per day. Gives you greater flexibility since you can switch between exams instantly 1, without exiting the current exam, for secondary review or consultation with a referring physician. Access up to eight1 processed exams instantaneously. Optimized performance for specific anatomies and indications, e.g. bone subtraction2 settings are tailored for carotid studies and are different from angio run-off settings, etc. Appropriate anatomy and indication processing protocol is automatically selected based on acquisition protocol. Automatic2 no-click coronary vessel tracking and segmentation. Colon is automatically unfolded2 and tracked for CT colonoscopy exams. Automatic2 myocardium functional analysis is processed for all cavities. Minimum 12GB RAM required for workstations. Requires x8400, x8600 or Z800 hardware. Or any AW Server Hardware. This feature is a productivity option in Volume Viewer which gives the ability to automatically load in memory cases that are transferred to the AW. A single click in the AutoLaunch window raises instantly the Volume Viewer protocol that has been automatically launched. Interaction with the data is immediately possible as data are preloaded and ready to read. The Centre Cardiologique du Nord (CCN) clinic has 182 beds and is specialized in cardiovascular disease. The centre performs 3000 cardiovascular surgical procedures and 1600 angioplasties per year. CCN has been a pioneer in cardiac CT since 1999, and continues to optimize acquisition and processing techniques to make these procedures more reliable and efficient. They perform 15 vascular and 15 cardiac exams per day on their LightSpeed VCT-XT system. This raises many productivity challenges, especially on the processing required to achieve a thorough assessment of the pathology.